I've been busy, busy making gifts. I wish I could share all the things I plan to make or have made, but you never know who will drop by and take a little peek. However, I am safe to share this scarf I made for my mom since she doesn't check my blog. Unless someone tells her (Yes, you bro! Shhh!). 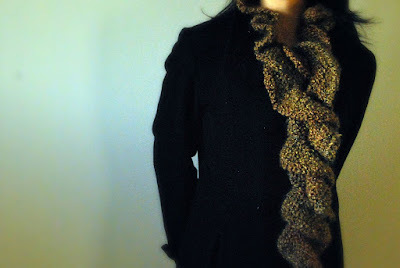 You can get this free Crochet Ruffle Scarf Pattern from Lion Brand. You must register, for free, onto their site to view their free patterns. For material I used Lion Brand Homespun yarn, 381 Barley. i make no promises.. lol just kidding. your secret is safe with me. i was actually trying to find you and ask you what youre getting for mom. im still so lost. same deal with dad.. what the crap am i supposed to get him?